Startups that are searching for a business model need to keep score differently than large companies that are executing a known business model. Yet most entrepreneurs and their VC’s make startups use financial models and spreadsheets that actually hinder their success. When I ran my startups our venture investors scheduled board meetings each month for the first year or two, going to every six weeks a bit later, and then moving to quarterly after we found a profitable business model. One of the ways our VC’s kept track of our progress was by taking a monthly look at three financial documents: Income Statement, Balance Sheet and Cash Flow Statement. To be clear – Income Statements, Balance Sheets and Cash Flow Statements are really important at two points in your startup. First, when you pitch your idea to VC’s, you need a financial model showing VC’s what your company will look like after you are no longer a startup and you’re executing the profitable model you’ve found. If this sounds like you’re guessing – you’re right – you are. But don’t dismiss the exercise. Putting together a financial model and having the founders understand the interrelationships of the variables that can make or break a business is a worthwhile exercise. The second time you’ll need to know about Income Statements, Balance Sheets and Cash Flow Statements is after you’ve found your repeatable and profitable business model. You’ll then use these documents to run your business and monitor your company’s financial health as you execute your business model. The problem is that using Income Statement, Balance Sheets and Cash Flow Statements any other time, particularly in a startup board meeting, has the founding team focused on the wrong numbers. I had been confused for years why I had to update an income statement each board meeting that said zero for 18 months before we had any revenue. 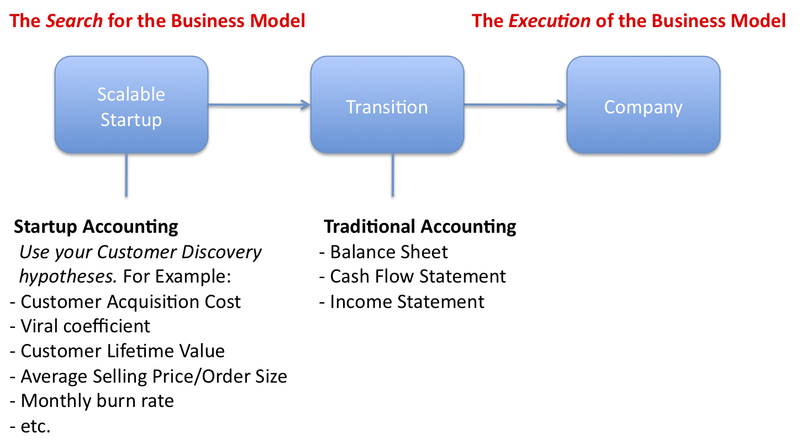 But What Does a Business Model Have to Do With Accounting in My Startup? A startup is a search for a repeatable and scalable business model. As a founder you are testing a series of hypotheses about all the pieces of the business model: Who are the customers/users? What’s the distribution channel? How do we price and position the product? How do we create end user demand? Who are our partners? Where/how do we build the product? How do we finance the company, etc. An early indication that you’ve found the right business model is when you believe the cost of getting customers will be less than the revenues the customers will generate. For web startups, this is when the cost of customer acquisition is less than the lifetime value of that customer. For biotech startups, it’s when the cost of the R&D required to find and clinically test a drug is less than the market demand for that drug. These measures are vastly different from those captured in balance sheets and income statements especially in the near term. What should you be talking about in your board meeting? If you are following Customer Development, the answer is easy. Board meetings are about measuring progress measured against the hypotheses in Customer Discovery and Validation. Do the metrics show that the business model you’re creating will support the company you’re trying to become? Startups need different metrics than large companies. They need metrics to tell how well the search for the business model is going, and whether at the end of that search is the business model you picked worth scaling into a company. Or is it time to pivot and look for a different business model? Essentially startups need to “instrument” all parts of their business model to measure how well their hypotheses in Customer Discovery and Validation are faring in the real world. For example, at a minimum, a web based startup needs to understand the Customer Lifecycle, Customer Acquisition Cost, Marketing Cost, Viral Coefficient, Customer Lifetime Value, etc. 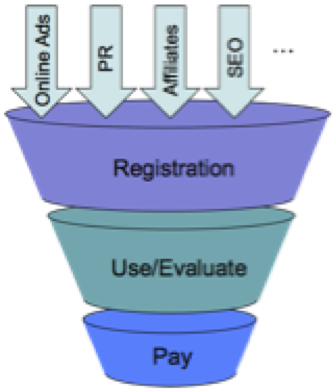 Dave McClure’s AARRR Model is one illustration of the web sales pipeline. A startup selling via a direct sales force will want to understand: average order size, Customer Lifetime Value, average time to first order, average time to follow-on orders, revenue per sales person, time to salesperson becomes effective. Regardless of your type of business model you should be tracking cash burn rate, months of cash left, time to cash flow breakeven. If you have venture investors, work with them to agree what metrics matter. What numbers are life and death for the success of your startup? (These numbers ought to be the hypotheses you’re testing in Customer Discovery and Validation.) Agree that these will be the numbers that you’ll talk about in your board meeting. Agree that there will come times that the numbers show that the business model you picked is not worth scaling into a company. Then you’ll all agree it’s time to pivot and look for a different business model. You’ll all feel like you’re focused on what’s important. Large companies need financial tools to monitor how well they are executing a known business model. Income Statements, Balance Sheets and Cash Flow Statements are good large company financial monitoring tools. Startups need metrics to monitor how well their search for a business model is going. Startups need metrics to evaluate wither the business model you picked is worth scaling into a company. Using large company financial tools to measure startup progress is like giving the SAT to a first grader. It may measure something in the future but can only result in frustration and confusion now. Thanks Steve, really excited about reaching this business stage. We’re working on traction/utlility and enjoyment of visits for Victus Media. Will keep the macro business scale of our endeavors in mind as we lock in to a sweet spot in the real time sematic information chain. What is the average time for customer validation? When I should know that something is wrong in my hypotheses ? I bought your book a couple of weeks ago. It is the best book about software entrepreneurship I have read so far! I have a question about the Customer Validation step, but I’m not sure where to post it. When I validate my assumptions by selling to a few customers, I promise to deliver the product to them at some date. Now, let’s say that only 1 customer buys it and it becomes clear that the others do not buy it for some reason that requires me to go back to Customer Discovery. What should I do with the single customer I promised to build a product for that failed the validation step? Should I somehow make sure that the customers I try to sell know that we will only build the product if we manage to validate the idea (by selling to 5)? Or is this a risk we just have to live with? Of course, we can try to see if the customer would like the new product instead, but this is not certain. Hey Frans, I would love to know the same thing. As I’ve been reading through the startup world I wondered the same thing. How do you “sell” your product, but then “unsell” it if you can’t deliver, or it doesn’t turn out to be profitable to keep going in that direction? Yes, traditional accounting in it’s current state doesn’t provide good OPERATIONAL data but it is still essential for at least a minimum of 3 reasons. 1: If you’re a Corp, you are required to maintain accounting records. 2: It is very expensive for businesses to recreate the necessary accounting data at a later time for – for example tax returns. 3: The balance sheet maintains balances for your physical resources (bank accounts) and keeps track of resource/obligation ratios. wow, I hate when I hit submit before I finish editing 🙂 – sorry about the rough read. Steve, another great post on startup finance! First, a question– have you found any good sources of data for benchmarking the User Base metrics? I realize it’s going to differ widely depending on the type of business (e.g. LinkedIn would be very different from Facebook which would be different from Zynga, etc.) but even a few good data sets would be useful to know if we’re “in the ballpark.” At present, we mostly rely on experience with similar, previous startups or occasionally, with some input from investors (who are seeing multiple businesses in the space). Second, a suggestion– one way we try to have our cake and eat it too– aka link the Startup Accounting with Traditional Accounting– is to build the model by starting with a dashboard for the User Base metrics (registrations, activations, upsells, viral leads). This feeds into a revenue buildup sheet, which then feeds the traditional income statement, CF, and B/S. Then, we create a sheet that breaks the income statement into per-unit economics: ARPU, cost-to-acquire, etc. I think the common reason for this wrong focus on wrong numbers is background of too many VCs. Those who come from investment banking, law or management consulting often have no frame of reference other than financials of a mature company. Avoid VCs with wrong background if you can. nice post Steve. I believe strongly in the need to go through the exercise of building a financial model (can focus mind and expose hidden assumptions and flaws), and agree that the focus should not be on formal financial documents or even on the resulting numbers themselves (that is, until you are up and running and have real numbers). A startup’s initial model becomes an iterative living document to track progress, and thus should be using key metrics that are important to the business and that you’ll actually track. No one benefits by over-complicating any of this. This is one of the best posts I’ve read on startup finances. I was excited to put my startup’s first financial model together. I spent a few days filling in templates that I had from B-School. A few weeks later I realized how complex this process was. I eventually put what I think was a good model together, but it was far more complex than I had been prepared for, I was left feeling like I wasted a lot of time. I was frustrated that I had to do this when I fully realized that all my numbers were guesses. As our model evolved, and we eventually started working with advisors who had CFO level experience with startups in our space, I could really feel not just our financial model, but our entire business model strengthening. The financial model is a living breathing model that reflect your best intentions for your business. It will never be right when you have little history to base it on, but it’s all part of the process to vet new businesses, and test various business models. For entrepreneurs with little background in creating these models, I strongly suggest finding an advisor with experience. Getting feedback along the way helps you create a more complete model, but also, like everything in the startup world, helps alleviate some frustration from a new process that can take weeks and months the first time an entrepreneur tackles it. This is great insight. There is a huge disconnect between reality and conjecture that’s often lost in a startup. The problem with “pivoting” is that it instantly implies that some assumptions were wrong up to that point; and when the walls start crumbling the whole supporting set of assumptions could create a total implosion. Even without a full implosion, when key assumptions fail, you are in a rescue mode to try to find assets to leverage and it tends to get super ugly figuring out what to jettison. Arguably this is why the VC model fails. It’s better to start with MULTIPLE SCENARIOS, instead of having one “be all, end all” and attempting to “pivot.” That argues for a CEO with the majority equity and enough liability to take the risks and know the options … not a room full of finance guys who believed bad assumptions guiding the person that fed them the bad assumptions. I have a bit of trouble with your defining a startup as “a search for a repeatable and scalable business model”. While a few entrepeneurs have managed to make successful companies this way, they are the exception, rather than the rule. Normally, a startup company has (or will have) chosen and will be following a thoroughly hashed-out business plan and credible revenue model before they hire their first employee. An extremely stimulating article. Let the search for scalability continue! Would you be skeptical about a team who pitched, for the first time, a non-traditional model, but proved its validity? If I’m sure my audience understands (because its an investor who has created a similar startup) the uselessness of traditional corporate models, why not just be blunt about it and portray the facts on your own accord? Thanks very much for a very informative article. It’s already generated a lot of useful discussions for us. I had a question though – it seems that most Technology startups would have very high fixed costs (wages/rent/utilities/server/internet/etc), but very low variable costs. Especially for the SaaS model. In that context, would you be able to provide a bit of insight as to how the Contribution Margin is helpful as a startup metric? I absolutely agree that a startup should focus on core actionable metrics around its conversion rates and per user economics. Unfortunately, however, continuing to produce GAAP financials will be a requirement – especially for any funded startups. I don’t know any investor / board member who spends a lot of time on them. But you still need to deliver them. As an VC, I’ve seen companies almost die due to the excess concentration of their entrepreneurs in “getting the numbers ready” month after month instead of focusing on what’s important: growing their business. As an Entrepreneur, I suffered seeing how my time was monthly wasted in putting the financial figures together, loosing precious time that could be used in what is important: growing my business. – Most VCs are financially-trained and learn to asses the company’s situation through the numbers. – All VCs are afraid of loosing control over their investments, therefore having neat monthly financial figures let them have a sense of control over their investment. The “I went to business school but don’t really know what to tell you to measure so I’ll have you do these.” quote struck a chord with me (F#7b9#11 for you jazz musicians). The powers that be (those you take money from) sometimes expect that the entrepreneur has to instantly satisfy whatever capricious thought that comes into their minds. Hence requests for all means of documents related mostly to their past personal expertise and interests (less often these are required to satisfy their company’s internal measurement processes). I had an investor on my BOD that taught a university course on corporate governance. I was therefore continuously bombarded with forms to fill out that were used for his corp gov classes (why not kill 2 birds with 1 stone?). Endless forms detailing things like – timely and balanced disclosure, remunerate fairly and responsibly, safeguard integrity in financial reporting, promote ethical and responsible decision making, etc., etc., you get the idea. Of course there’s nothing wrong with corp gov, it has it’s place, but it started becoming a key focus of BOD meetings. He believed that if the corporate gov checklists were all filled out and reviewed at every board meeting, then everything else would magically fall into line (we weren’t public, we were a brand new start-up). I eventually put a stop to it. Having a clear focus on how to make attractive and effective organization, is the only way to grow a new business. how many startups died of big dreams but no sense of reality.. I have presented in Board meetings (not VC sponsored though) numbers that meant nothing to anybody but took lot of time to prepare. I would have liked the meetings to focus on validating or trashing the basic premises or assumptions on which the entire business model was structured. To accept them as sacrosanct and worry about the numbers is putting the cart before the horse, imo. What would also make the BMs effective and productive is checking up the alignment of the processes and activities with the Vision, fi there was one in the first place! Its easy to get distracted by our own excitement or what happens in the market place and make that as the foundation for our future plans. The Board really needs to step in and keep things aligned towards a common purpose. Do you have any thoughts about difference and similarities you have with his point of view? Do you stand behind your “worse than useless” comment or is it a rhetorical flourish? Just trying to figure out if there is any genuine disagreement between two of my favorite bloggers. I think a key idea got lost in the translation – my post was not about “accounting” it was about how accounting substitutes for metrics about your business model. VC’s and entrepreneurs confuse the two. Fred’s post talked about “accounting” which he defined as “Accounting is keeping track of the money in a company.” I think that’s a great definition. Unfortunately at board meetings “accounting” is all that some VC’s have you measure. My point is that the metrics as you search for your business model will not be found in “Accounting.” It will be found by agreeing on a set of business model metrics. They may be: customer acquisition cost, viral coefficient, average selling price, etc. And that these metrics are more important in the early days of a startup than Just the ones for accounting. See if you can sneak in some metrics. We find that the accountant is the most key advisor that a company can have. A good accountant, a CPA with a diverse background, provides more of a holistic consultative role to a new company, and can be key in its long-term success..
Find a well rounded CPA firm to work with, and one who actually deals regularly with start-ups. Especially here in Los Angeles’s Silicon Beach there are a few of us who provide services locally and nationally. Find an accountant which can develop a rapport with. If you feel comfortable consulting your advisors (CPA, attorney, etc. ), then they provide far more value.